A Cal State LA Commencement. CSLA was called out in the report as a campus to emulate for mobility. An organization using data to understand how to improve the economic opportunities for low-income people has developed a set of "mobility report cards" to rank universities and colleges by how well their students "climb the income ladder." The mobility rate defined by the Equality of Opportunity Project considers a college's access, the size of the population of students from families in the bottom fifth of income distribution and its success rate in helping those students move into the top fifth of income distribution. California State University, Los Angeles came closest with a mobility rate of 9.9 percent. The access rate for Cal State LA was 33.1 percent; and the success rate was 29.9 percent. 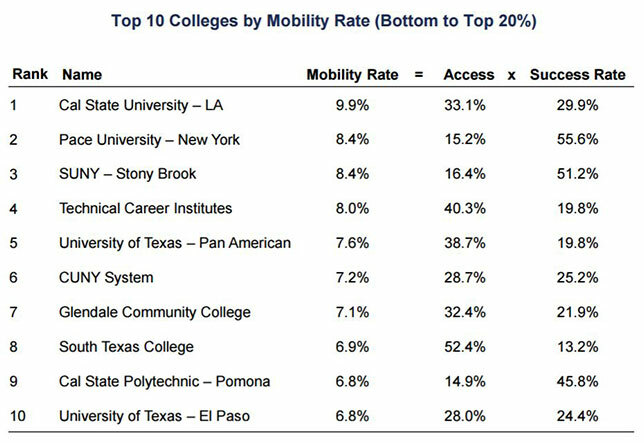 Pace University and Stony Brook University in New York both came in second with a mobility rate of 8.4 percent. Access at Pace was 15.2 percent; the success rate was 55.6 percent. The access rate at Stony Brook was 16.4 percent, and the success rate was 51.2 percent. The proportion of students from low-income families in any given institution varies widely. The "Ivy League" schools tend to have more students from the top 1 percent of families than the bottom 50 percent of income distribution. At any given school, students from low- and high-income families have similar earnings outcomes. Schools that shift the most students from the bottom fifth to the top 1 percent tend to be highly selective, such as the University of California Berkeley, MIT and Harvard. Access rates have fallen for low-income families since 2000. While the fraction of students from the bottom income-earning rungs at elite private colleges has increased slightly, the rise is less than the increase in the share of students who receive Pell grants, the oft-used proxy for low-income. One "lesson" shared by the researchers is to encourage the mid-tier institutions with high mobility rates to expand their access even further rather than putting so much emphasis on expanding access at elite colleges. Doing so "may provide a more scalable model for increasing upward mobility for large numbers of children," a report based on the findings stated. Besides, the authors noted, the schools with higher mobility tend to have considerably less expensive instructional costs: $6,500 per student on average versus $87,000 per student at elite private colleges. "This study ... really lays the groundwork for future study on how places like Cal State LA can be emulated," said Robert Fluegge of Stanford University, one of several researchers involved in the study, in a prepared statement. "We want to understand exactly what is going on at places that look really good by our metrics." The study's authors also included researchers from UC Berkeley and Brown University. The research was based on anonymous tax filings and tuition records from the federal government following 30 million college students from 1999 to 2013. A summary of the project, as well as links to the full research paper, a non-technical summary, links to data and other resources are available on the Equality of Opportunity website here.